The Rap Sheet: TV’s New Standard for Procedurals? TV’s New Standard for Procedurals? 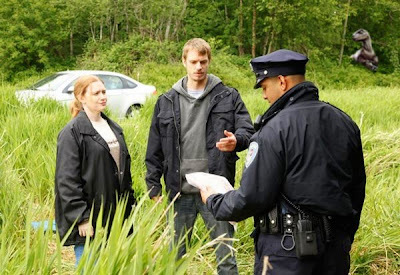 Detectives Sarah Linden (Mirelle Enos) and Stephen Holder (Joel Kinnaman) pursue a missing girl in the premiere of The Killing. AMC-TV’s masterful new Sunday night drama, The Killing--based on a wildly popular Danish series--grabs you first with its conceit: one case. In a television landscape where the police procedural has become commonplace, where the bodies stack up in cities from Los Angeles to New York (with stops in Vegas and Miami), and where we revel in the quips of a David Caruso or the quirks of a Kyra Sedgwick as they bounce from garish case to garish case, The Killing proposes to spend an entire season investigating one murder in Seattle, Washington. The show--developed by Veena Sud, a veteran of Cold Case (among the better CBS procedurals), and returning tonight at 10 p.m. ET/PT--will play out in something resembling real time: Each episode of this season equates to roughly one day of the investigation as it continues over 13 days. While the original Scandinavian noir series, Forbrydelsen (“The Crime”), was of course based in Denmark, and was English-subtitled for its broadcast earlier this year in Britain, The Killing is told all in English and takes place in drippy Seattle--although nearby Vancouver, Canada, actually stands in for Washington’s coffee capital. Peter Wunstorf’s blue-gray cinematography evokes the grim landscapes one might find in a story by Michael Connelly or Dennis Lehane. And as those same authors might have done, The Killing makes it clear that the death of teenager Rosie Larson matters. It matters to longtime homicide detective Sarah Linden (Mirelle Enos of Big Love), who’s on her last day of employment when she gets drawn into what seems like a simple disappearance. And it matters to her new partner/replacement, Stephen Holder (Swedish actor Joel Kinnaman doing an astonishingly good American accent), a transfer from vice. Kinnaman delivered a scene near the end of last Sunday’s two-hour premiere that reminded me of Jon Hamm’s performance in Mad Men’s pilot: In one breath, I was thinking to myself, “Who is this guy?,” at the same time as I realized I was completely hooked on the series. That’s not to take anything away from actress Enos, who is also quite good as the first female lead for an AMC series in a while. Much like how Sud subverts our expectations of the “mismatched partners” dynamic when dealing with Linden and Holder’s relationship, Enos is stripped down and stoic here, free of the eccentricities or neuroses that most female TV detectives seem to bear. She’s an observer, a thinker; and one of the gifts The Killing gives viewers with its long-play, single-case format is to allow Linden time to do those things, to react. More than a couple of times while watching The Killing, I thought of Jodie Foster’s performance as Clarice Starling in The Silence of the Lambs. While Linden is far more confident here than Starling was, the idea of a woman operating in what is predominantly a man’s world pervades The Killing. Coupled with Sud as a showrunner and Monster director Patty Jenkins doing the first half of last week’s introductory episode, that theme adds an extra level of subtext and fascination to this show. Too often we see horrible crimes committed against women, but give no thought to the repercussions. 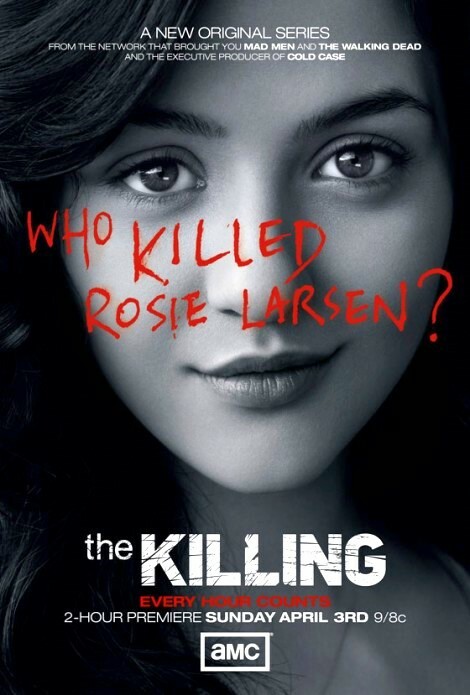 While The Killing doesn’t shy away from letting its audience know what happened to Rosie Larson, it makes sure we feel the tragedy and loss of it, too. Which brings me to the reason why you absolutely must watch The Killing. That’s because, for the first time in as long as I can remember, this show makes the effort to really explore the effects of violent death on the family of a victim. Stan and Mitch Larson, played by character actors Brent Sexton and Michelle Forbes, occupy the bloody, beating heart and wounded soul of The Killing. The series honors their potentially career-reinventing and Emmy Award-winning performances by giving them the time they need to let their characters occupy the place of terror, guilt, and wrenching grief. There was one particularly poignant scene in the two-hour premiere, during which Stan and Mitch struggled to tell Rosie’s younger brothers about their sister’s death. I don’t think I’ve ever seen such a moment portrayed so well on television. It was a scene that left me grateful for the concept behind The Killing--without it, would the show have spent the time necessary to give that small but emotional exchange its power? It’s something close to an acting miracle, watching Forbes and Sexton bring that raw pain to life in a way that put a lump in my throat and a hand at my mouth. Also excellent is this show’s score by Frans Bak, who provided the music for the original Danish series. It’s reminiscent of electronica-inspired scores by James Newton Howard or a later-era Michael Mann film. It gives The Killing an appropriately haunting feel, without completely overdoing it with strings and horns and James Horner clichés. I haven’t said anything yet about Billy Campbell, who plays a Seattle mayoral candidate whose campaign might have ties to Rosie Larson’s death. That’s because the former Rocketeer star could be the only weak link in this series. The script is setting him up to be either the murderer or a massive red herring. He’s certainly not the cops’ only suspect, though. There seemed to be clues and tantalizing distractions layered throughout The Killing’s premiere that will make this program a true “novel for television--a single story playing out over one season, rewarding repeat viewings on DVD, much like how we return to our favorite crime novels again and again. One season. One case. It’s a premise reminiscent of interesting earlier shows such as Steven Bochco’s Murder One (which focused on a single murder trial), as well as increasingly outrageous ones like 24. But this is AMC, known for taking similar high-concept ideas like “schoolteacher gets cancer, cooks meth” and “a man’s man at a 1960s ad agency; nostalgia rules!,” and creating rich, nuanced drama with memorable characters and unique visual styles. There are many ways the concept behind The Killing could have gone wrong in execution. Instead, this Sunday night serial is shaping up to be one of the strongest crime shows in years. It might, in fact, be as much a reinvention of the procedural as Deadwood was of the western or The Sopranos was of mob dramas. I’m not kidding. It’s just that damn good. The Danish version has just finished in Britain and was a sensation. I did a piece on CrimeTimePreview.com called 10 Reasons Why The Killing Is the Best Thing on TV and received thousands of hits and comments. All of which confirmed that people are gagging for a good drama with well-rounded characters, rather than the routine of car chases and body mountains. I'm looking forward to the US version, but I think you're right – it's set a new standard for the well-worn procedural. I am enjoying this too, but Billy Campbell has never been more than a pretty face to me. Hope he doesn't spoil it. Wish they had cast a lesser known actor. He throws things off. Very intrigued by this but why is there a dinosaur in the picture? Why is there a T-Rex in the background of the picture?!! Heh Deborah, well spotted! That photo is a 'spoiler' as I can assure you that the Verciloraptor [hiding in the forrest] that features heavily in episode 3, is a red-herring, as he was proven innocent in the Danish original. Hi Ali, a dinosaur as a red herring eh? Curiouser and curiouser! Thanks to everyone for the comments. I'll be checking back in on "The Killing" as the season progresses (probably every couple weeks or so), and may also cover the first season of the Danish version as well.